So another F1 season begins, and for all the hype surrounding the 'First Race of the New Millennium' (unless, of course you're Swiss and choosing to wait another year to celebrate that milestone) things do not appear to have changed that much on the surface. The teams are as last year (except the Stewart Fords have been rebadged Jaguar Cosworths, and have taken to dropping oil left right and centre in the process), and there are just three new drivers this year (more on this later). Nonetheless, everything looks quite different, thanks to a few changes of sponsors. It appears cigarette manufacturers are slowly being replaced by electronics giants, and, while I'm all in favour of protecting the lungs of impressionable young kiddies, the electronics giants could learn a thing or two from the tobacco barons in terms of style. Worst offender in this category is the truly hideous new 'Orange Arrows'. The prettiest car on the grid last year, it now looks the colour of a BR rail ticket...and with Orange being a mobile phone company, we may only be swapping lung cancer for brain tumours anyway. The new Williams isn't a whole lot better, come to that. Compaq and BMW have contrived to give the new car a distinctly maritime look, which is a shame because if they had painted it BMW bleu it could have been one of the best looking cars on the grid. Jaguar, too, seem to have spent an awful lot of time looking for the most putrid shade of green to colour their cars, and then go and make matters worse by sticking white HSBC logos all over the top of it. The evidently colour-blind Martin Brundle called them the 'most elegant cars on the grid'. Still, considering that the adage that 'if it looks right it'll go right' was comprehensively disproved some 14 years ago by those stunning, yet utterly ineffective Low-line Brabhams, the question remains as to who is on the pace. Once again, the answer certainly isn't Jaguar. The team hold the dubious record of posting the first two retirements of 2000, with Herbert and Irvine both out by lap seven. To top it all, neither car had been running in the top half of the field at the time either. In the battle of the luxury car giants, Mercedes too, faced embarrassment. McLaren remained on top, posting fastest times in qualifying and leading the race from the start, but by 1/3rd distance, both Mercedes engines had gone up in smoke. This inevitably left it to the Ferrari boys to get on with the job of winning the race. Which, in modern F1 parlance means, it was left to Herr Schumacher to get on with the job of winning the race. 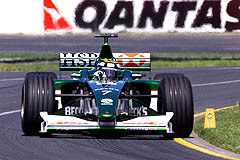 This he did without a whole lot of difficulty; Barrichello may be a lot closer to Schumacher than any of his previous team mates (just a few hundredths slower than an admittedly rather messy Schumacher in qualifying) but he spent much of the race held up behind Frentzen's Jordan and never really made up the difference. There wasn't much between the Jordan boys either, but as in the Ferrari camp, it was the German who consistently held the upper hand, albeit by a much reduced margin than the one he enjoyed over Mr Hill last year. As it happened, it didn't really matter, as the Jordans went the same way as the McLarens. Team boss Eddie Jordan said he'd swapped reliability for performance, so he may be disappointed his cars were still so far behind the Ferraris and McLarens. There wasn't much separating the rest of the midfield. The BARs, Benettons, Williams, Saubers, Arrows and Jaguars ran pretty much together for the whole of the race...leaving aside the fact that those last two teams didn't have any cars left running after ten laps. With Bridgestone putting most of its' development work into Ferrari and McLaren, and only Jaguar being in possession of one of the latest generation of lightweight engines, the midfield is likely to be where these teams remain. Of the midfield runners, the bulk of the attention, at least as far as anyone receiving the Murray and Martin television show, was focussed on Jenson Button. He was lucky enough not to hit anyone or anything, and probably overtook more cars than anyone else before his engine gave up near the end. I can't help feeling that Nick Heidfeld would have been at least as quick had he been in the Williams, but with Heidfeld contracted to BMWs arch-rivals Mercedes, he was never an option for Frank. Ricardo Zonta was a lot closer to his team mate Villeneuve than he had ever been before, spending most of the latter part of the race at the tail end of a train of cars that Villeneuve headed. All the same, talk that he is a future world champion in the making remains, as it has ever been, hyperbole. As for who had the worst weekend, it initially looked like the Prost team would win that competition hands down. They were a couple of seconds slower than anybody else in Friday's free practice, but come Saturday they had made enough time up to leapfrog the Minardis and run at the tail-end of the midfield. One rather suspects that messrs Alesi and Heidfeld would have done rather better than that in any other car. Benetton found themselves no faster than the supposedly unfancied Arrows. Given they have the same engines and Benetton have rather more highly rated drivers, there will be some head scratching in Witney over the enxt two weeks, especially as they thought they had taken a great leap forward with the new car. Coulthard came back from the winter, talking the talk but resolutely failing to walk the walk. He was slower than Hakkinen when it mattered, once again, and capped Saturday afternoon off by dumping his McLaren into a wall, coincidentally foiling Schumacher's attempt to dislodge his team mate from pole position in the process. All in all the new season looks like being much as the last. Ferrari are a little closer to McLaren, and Jordan a little further clear of the chasing pack. The tail end are a little closer to the midfield than before, and it looks like being an interesting season.